Find our latest News and Webinars from the CLE Community HERE. Quarterly CLE Industry Reports: Tracked behaviors and underlying motives detailed in quarterly CLE behavioral reports allow you to deeply understand the evolution and current trends. Custom Engagement: CLE Community Engagement Services allow you to rapidly answer your custom research questions, through exceptionally fast turn services support learning sprints and build proprietary knowledge. Heightened consumer “sensitivities” toward clean labels is impacting buying behavior in the marketplace more and more. This unique Clean Label Enthusiasts™ (CLE) community from InsightsNow is made up of these “forward thinking” primary shoppers in this rapidly growing consumer segment—with distinct points of view about ingredients, claims and brands. 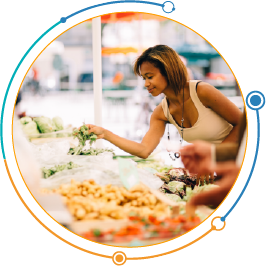 While the free-from movement poses many challenges to the food industry, the CLE community gives you the opportunity to quickly find answers and insights to solve your business challenges—and respond in an agile and effective manner to consumer demands. When you gain access to the CLE community you get to the “whys” of free-from behavior, faster—and that’s essential in today’s fast-moving, consumer-driven marketplace. Custom research and interactive tools allow you to instantly tap into insights about how ingredients, claims and brands are influencing shopping behavior. By custom segmenting the CLE community according to your own business needs, you cost efficiently access your own target consumer groups to quickly answer questions. And CLE behaviors and underlying motives are tracked for you through quarterly behavioral reports. Listen & Observe: What community members say and do “in the moment” gives you insight into behavioral truths. Engage & Interact: Various integrated qualitative approaches with the online communities delve quickly into your consumers’ deep-rooted motivations and behavioral cues. Measure & Understand: Using proprietary behavioral measurement and reporting methods, you can deeply understand community attitudes and emotions to help you make business decisions happen faster, with greater success. A community of Clean Label Enthusiasts is answering some specific questions to provide guidance that speeds development and improves market success.